Once your tree has been cut down and removed the unsightly stump needs to be dealt with. Stumps left just above the surface can present possible safety hazard as well as harbor diseases that could potentially spread to your existing healthy trees. This is where our experts at Riverdale Tree Service will come in and professionally remove the stump and roots that are left just under the surface. By removing the entire tree we ensure that you will not have any more shoots coming up requiring constant attention. 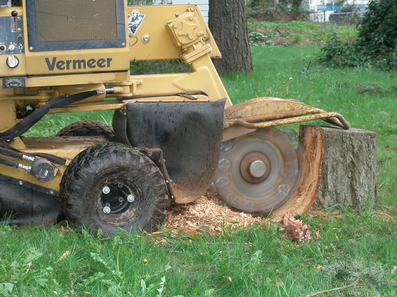 Stump grinding is done by using a special machine that requires proper training. Stumps and roots need to be removed 6-8” below grade. Sinkholes will not appear when you have a stump ground. By properly inspecting the stump before grinding, there may be other options available. Call us today for a free quote for any and all stump grinding needs you may have.